The design of the Shanghai Tower was confirmed in 2006. Its construction was finished in 2014. And it has been open to tourists since January, 2017. Sitting 632 meters (2,074 feet) above the ground, the Shanghai Tower is the highest building in China and the second highest in the world. 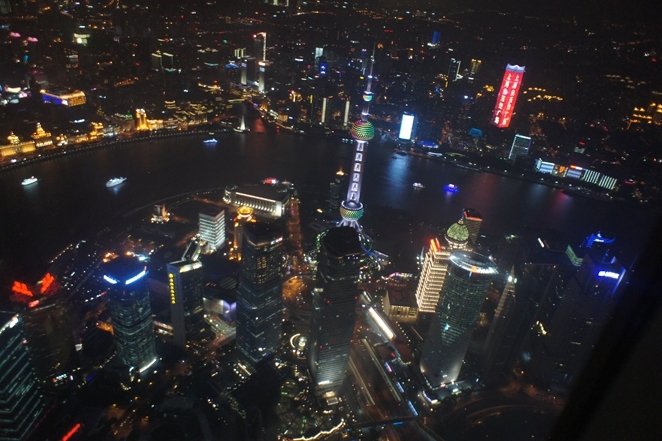 You have a Chance to touch the new skyline of Shanghai now! The exhibition hall is located on the basement 1 of Shanghai Tower. Several videos are being played in the hall. Watching these videos before starting your adventure in the tower will make you understand Shanghai’s history and the skyscraper better. The highlights of the videos are listed below. You will have a quick glance of the development of Shanghai since 1840 AD. The economy is increasing day by day and the record of the height of the skyline of Shanghai is being broken continuously. Finally, you have the Shanghai Tower, the highest skyscraper in China so far. The construction of the first skyscraper in the world was finished in 1885. From then on, thousands of skyscrapers joined in the race of height. You will know the highest buildings in the world at different times, including the highest one till 2020, from the video. The Shanghai’s Shanghai Center consists of videos and old photos. The change of Shanghai-style architecture is reflected by these multi-media works. Lots of old buildings in the videos have a history of over 100 years. After enjoying the videos, it is time to ascend to the 546-meter-high (1,791 feet) observatory to enjoy a bird view of Shanghai. The world’s fastest lift in the Shanghai Tower lets you reach the observatory in only 55 seconds. Covering an area of around 1,000 square kilometers, the Top of Shanghai Observatory is located on the 118th floor of Shanghai Tower. Its 546 meters’ height and glass wall allow you to have a bird view of Shanghai city. You will get an experience of walking in a sky city when you see the Oriental Pearl TV Tower and World Financial Center from the observatory. There is a post office on the observatory. You can share your excitement of standing on the highest building in China with your friends by sending them postcards. You can also write a wishing card and hang it on the wishing tree on the observatory. You wishing card will welcome the first bunch of sunshine with the highest building in China every morning. Your adventure in the tower will come to a climax when a light show on the observatory makes you feel like the floor are breaking apart and you are going to fall down from the sky-high observatory. The Guanfu Museum is located on the 37th floor of Shanghai Tower. Porcelain vases and plates, ancient handcrafts, gold artworks and Buddhist statues are major exhibits in the museum. Most porcelain vases and plates in the museum were made in Song dynasty (960-1279 AD). People began to made porcelain not only for daily needs, but also for art during Song Dynasty. The 133 porcelain vases and plates with great aesthetic value will make you fully understand the charm of porcelain. Most ancient handcrafts in the museum were made in Europe in the 18th century AD, but they were all designed in Chinese style, because with the development of trade more and more European people began to like Chinese products during the 18the century AD. If you visit the Shanghai Tower at night in a clear day, taking a photo of the three towers (World Financial Center, Shanghai Tower and Jinmao Tower) is a must-do. 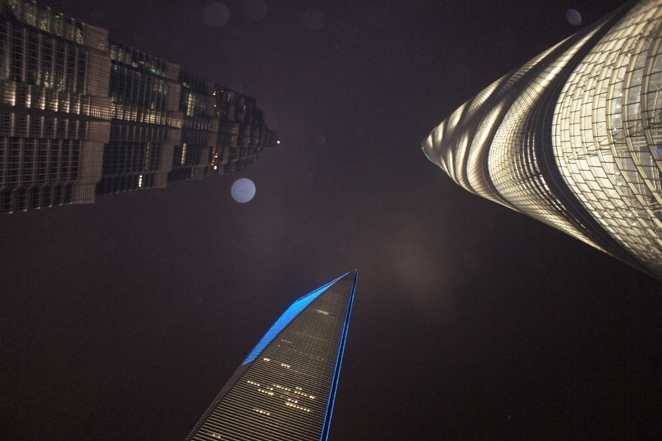 You can see the scene as the photo below shows by looking up beside the entrance of the Shanghai Tower. We wish you will see a brighter moon than the moon in the photo, because Chinese people believe the brighter the moon is, the better you will become!